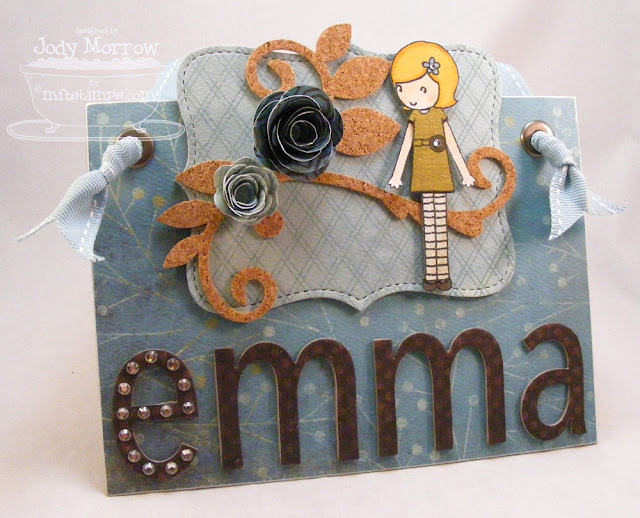 I hadn't used the new set, Meet Emma & Wyatt yet, so I decided to make Kim's daughter, Emma a door-hanger using the set. The same artist that draws the Pure Innocence girl drew this new character and I love the sweet, slightly older character. I colored the Emma image in the REAL Emma's likeness. I used a new Sizzix die I got with the new MFT Cork to create the leaf flourish. Have I mentioned that I L-O-V-E the MFT cork? It comes in 6, 6" X 6" sheets and is FLAT. That is super important, because cork that comes in a roll, has a "memory" and will not lay flat. It's SO annoying when I am trying to use a die and the cork keeps curling up. Never mind AFTER you actually cut it and are trying to adhere it to your project... You MUST get the MFT cork. The rolled roses were made using another new Sizzix die I got. I am in L-O-V-E with that thing, too. It's SO cool. It cuts the paper for you (duh) and then all you have to do is roll it and stick a glue dot at the end to keep it rolled. SO cool. Now, I can have rolled flowers to match ANY paper. YAY for matchy matchy! The panel that Emma is adhered to is a SU Sizzix Top Note die that I had adhered paper to heavy weight chipboard prior to cutting in my Big Shot. The bigger panel is also heavy weight chipboard that I adhered patterned paper to. The letter were die-cut using again (SU alpha), heavy weight chipboard covered with patterned paper BEFORE cutting. I blinged the first letter with Swarovski crystals. I added jumbo pewter eyelets and some wide ribbon to hang the sign with. This is adorable Jody! I'm sure Emma will love it. And I love the way you pointed out the details, I would have missed the garnishes in the flowers! LOVE this Jody! 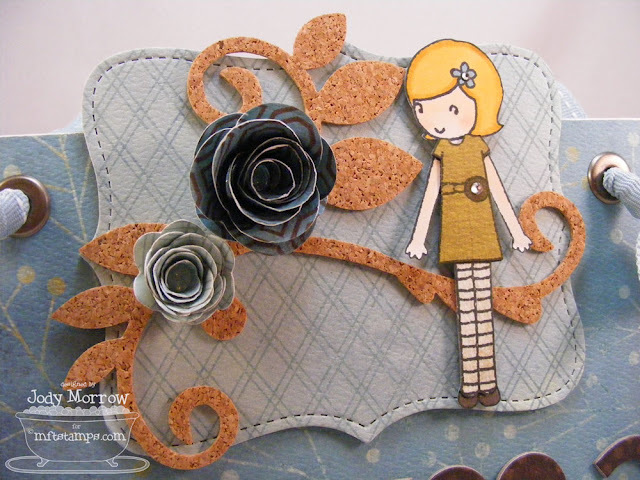 I totally LOVE the MFT cork...I already think I am going to order some more! LOVE the rolled flowers too!! I'm sitting here at work LOL... on your "not to be missed" section you said, Garnishments SHOVED into the center of each flower! SO glad there wasn't any froofy terms used cuz shoving is SO necessary sometimes!!! LMAO!